Penselwood is a village and civil parish in the English county of Somerset. 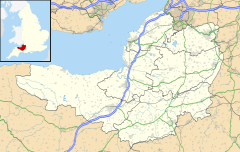 It is located 4 miles (6.4 km) north east of Wincanton, 4 miles (6.4 km) south east of Bruton, 4 miles (6.4 km) west of Mere, and 5 miles (8.0 km) north west of Gillingham. The south-east of the parish borders Zeals and Stourhead in Wiltshire, and Bourton in Dorset. In 1991 the parish occupied 523 hectares (1,292 acres). It is the start of the Leland trail a 28 miles (45.1 km) footpath which runs from King Alfred's Tower to Ham Hill Country Park. The medieval form of the name was "Penn in Selwood", where pen (Brittonic for "head") probably referred to a hill and Selwood was the Selwood Forest which once surrounded the area. David Nash Ford associated nearby Ilchester with the Cair Pensa vel Coyt  listed among the 28 cities of Britain by the History of the Britons on the basis that it should be read as an Old Welsh form of 'Penselwood' (coit being Welsh for "forest"), although others view it as three separate words: Pensa or Coyt. Bishop Ussher believed the listing referred to Exeter instead. A couple of miles north of the village amidst the trees is the remains Kenwalch's Castle, an Iron Age hill fort which may be the location of the Battle of Peonnum in 658, mentioned in the Anglo-Saxon Chronicle. The English also made a stand here against the Viking invader Cnut the Great in 1016. Pen Pits quern quarries north of Combe Bottom are a series of bowl shaped pits which were used as stone quarries during the Iron Age, Romano-British and Middle Ages. The parish of Penselwood was part of the Norton Ferris Hundred. Just outside the village is the site of the medieval motte and bailey castle known as Ballands Castle. It is also part of a county constituency represented in the House of Commons of the Parliament of the United Kingdom. It elects one Member of Parliament (MP) by the first past the post system of election, and part of the South West England constituency of the European Parliament which elects seven MEPs using the d'Hondt method of party-list proportional representation. Moldrums Ground includes a dry woodland surrounding unimproved grassland. Ponds on the site provide a habitat for northern crested newt. It is a local nature reserve. The Church of St Michael and All Angels was built in the 15th century. It is a Grade II* listed building. Penselwood is the setting for James Long's books, Ferney and its sequel, "The Lives She Left Behind", both of which mention many of the historical events that took place in or near the village. ^ British History Online (1999). "'Penselwood', A History of the County of Somerset: Volume 7: Bruton, Horethorne and Norton Ferris Hundreds". pp. 184–192. Retrieved 16 August 2006. ^ a b Bush, Robin (1994). Somerset: The complete guide. Wimborne: The Dovecote Press Ltd. p. 167. ISBN 1-874336-26-1. ^ Havinden, Michael. The Somerset Landscape. The making of the English landscape. London: Hodder and Stoughton. p. 79. ISBN 0-340-20116-9. ^ "Pen Pits". Pastscape. English Heritage. Retrieved 21 September 2014. ^ "Moldram's Ground". Pen Selwood. Retrieved 25 August 2015. ^ "Moldrums Ground". Natural England. Retrieved 26 August 2015. ^ "Church of St. Michael and All Angels". National Heritage List for England. Historic England. Retrieved 22 April 2018. Wikimedia Commons has media related to Penselwood. Cranborne Chase and West Wiltshire Downs Area of Outstanding Natural Beauty (AONB) Partnership (June 2003). "Cranborne Chase and West Wiltshire Downs, Land Character Assessment, Type 7: Greensand Hills, 7B Penselwood – Longleat Hills" (PDF) ( PDF). pp. 183–189. Archived from the original (PDF) on 18 July 2011. Retrieved 7 October 2010. This page was last edited on 23 April 2019, at 09:13 (UTC).